At work I have been using Redhat Enterprise Linux 6 for some time to run some multimedia equipment. With the need to upgrade to new software and hardware I’ve had to also look at upgrading the OS to meet some of the requirements for the new software. The new version has some significant “upgrades” in the form of using Gnome 3 and systemd, lets see how good they are. Gnome 3 is a significant departure from the previous version, it is clearly heavily influenced by Mac OSX and tablet interfaces. Personally I am not a huge fan. Most of the customisation features that were in Gnome 2.x have been removed. Some I miss the most are placing application launchers and widgets on panels and having a proper visual pager for the work spaces. There seems to be very little option for any customisation at all. There are some small improvements however. The configuration dialogue for the network setup is nice and simple, but still allows for more advanced settings if required. The calendar is cleaner and incorporates your schedule information in the display. Still it somehow feels very uninspired. Even the lock screen leaves something to be desired. It expects you to uncover the password entry box by swiping upwards or doing the equivalent with your mouse before you can enter your password and unlock the screen. This is annoying every time I come back to my computer as it adds an extra step to an otherwise simple process, it is completely unnecessary. From what I can tell it was added simply as eye candy. Gnome 3 certainly isn’t ugly, it is full of eye candy everywhere. Lots of animations and fades that you couldn’t do on older hardware because of performance concerns. But I find the lack of customisation features makes the desktop feel sterile, I can’t make it my own, which is something I’d expect from Apple, not a open source desktop environment. Systemd is the other perhaps more controversial change, there has been much debate and flaming across the internet from both sides. Basically it is a replacement for sysvinit and a number of other small daemons such as cron and the login process. I did note in this instance that RHEL 7 still includes and runs crond and rsyslogd even though systemd has replacements. I’m guessing they are _trying_ to ease the pain of migration. I had a look into the configuration files for systemd, and whilst they are at least readable and you can edit them, there are many options that aren’t clear. It is however easier than the old configuration system under sysvinit, but no-where near as nice as the RC system under BSD which is much easier to handle. The thing I felt was the most concerning is the binary log files, which fortunately you don’t need on RHEL 7.0 because of rsyslogd logging in a readable format. There are many technical issues with systemd that could and should be addressed, but I don’t think they are really the source of most of the conflict. It seems to me that the proponents of systemd have cleverly and somewhat underhandedly managed to force a number of larger Linux distributions to use it. The long and short of it is that because they managed to merge udev into it, and have been swallowing other small important services, it is forcing its way into many distributions regardless of merit. Using such means was always going to upset many people. If they had only replaced sysvinit instead of swallowing up so much and behaved better when it came to bugs and criticism, many people would have fewer or no arguments against it. On a technical level I understand why systemd was made, sysvinit was a bit of a pain, although extremely flexible. But I disagree with them replacing and swallowing other services into the main init package. Larger more complex software is more likely to have bugs and security flaws, and the init process is perhaps the most important one in terms of security. The fact that they have practically coerced people into using it is distasteful. It seems that the systemd devs are attempting to co-opt the entire Linux eco-system to control for themselves. I don’t know why OpenRC wasn’t adopted as it’s a quite nice clone of the BSD rc.d system which I’ve found _very_ easy to use and works very well. 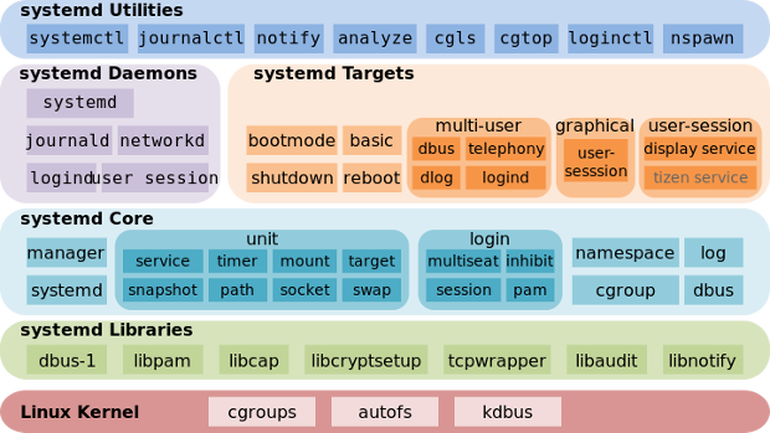 The problem now is that systemd has incorporated important parts of the Linux OS that now make it difficult to use anything else, and will likely make implementing portability to BSD difficult but not impossible. I suspect that a compatibility layer will eventually be created for the BSD systems. I didn’t mean this to be a rant about systemd or gnome 3, but there is little else to talk about in the base install of RHEL 7.0. It was pretty bare bones, which isn’t such a bad thing, but it was even lacking some of the useful system tools such as the disk utility. I found many packages seem to be older than they should be, which has caused some minor issues, but this is something common to the older releases. I’ll still end up using this RHEL due to requirements at work that are unavoidable, but I won’t be recommending it to anyone that can avoid it. I was considering using a form of Linux on my home desktop system to replace the ageing windows install, but seeing Gnome 3 and systemd has made me reconsider my position. I’m seriously thinking FreeBSD may be better for me, but if I do install a Linux it will likely be Debian, as that is generally a bit friendlier to power users. I’ll almost certainly not use Gnome and systemd if possible, but given the politcs currently in process that may become difficult.